It's finally hot, so here's a cool idea. Ben and Jerry's Catering. Give them a call and they'll make your employees or your customers very happy by delivering cones, sundaes or a deluxe sundae bar wherever you want. They'll also come out to your business meeting, company picnic, family party, wedding or any occasion. And they'll cater any size event. Choose any six flavors, they'll bring cones and cups, hot fudge, caramel, whipped cream sprinkles...the works. Just call them at 509-455-8500. And you can always stop by Ben and Jerry's scoop shop in River Park Square. Visit them at www.benjerry.com/riverparksquare or www.facebook.com/#!/BenJerrysSpokane. Latah Creek Wine Cellars, Spokane's oldest winery and the 20th oldest in the state, celebrates 30 years of wine making this month. Latah Creek is well known around the region for producing a variety of wine, 15,000 cases (40,000 gallons) annually, including one of the best Merlots in the state of Washington, according to Wine Spectator Magazine. Latah Creek is a family owned business operated by Mike and Ellena Conway and their daughter Natalie. 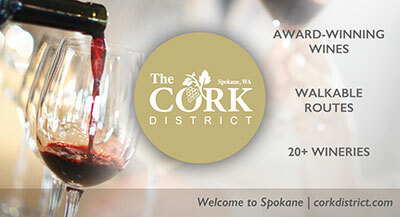 Mike Conway was recently recognized by the Washington State Wine Commission as one of the state's wine industry 'groundbreakers'. 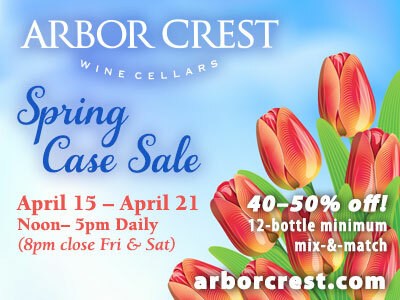 The winery is located at 13030 E. Indiana Avenue, and is open 9 am to 5 pm daily. For more information visit latahcreek.com. Contract Design Associates (CDA) just finished the project management and installation of over 900 workstations for Liberty Mutual Insurance. They moved into the old Agilent building from another location in Liberty Lake. CDA had to de-install 213 existing stations, move them, and re-install them along with adding 700 new stations as well as conference rooms, training rooms, and private offices. This involved 23 each 53' semi trailers of product and well over 1 million parts and pieces. All done in 7 weeks, with no punch list. Schweitzer Engineering Laboratories, Inc. (SEL) today announced they will open an office in Spokane Valley this fall. The engineering and manufacturing company based in Pullman, Washington, will renovate a 7,076-square-foot office space at 3808 Sullivan Road. The company will lease the office space, formerly a National Car Rental office, from Crown West Realty. "It will primarily be a research and development office, but with the vast array of SEL employee owners who commute from the Spokane area, we are exploring lots of options," said Dave Whitehead, Vice President of Research and Development. "If they can do their job functions from there, it makes sense to have them work in the office nearest to their homes." In the last year, SEL built a new 109,000-square-foot manufacturing facility in Lewiston, Idaho, also largely to accommodate the employee owners who were commuting to Pullman from the Lewis-Clark Valley. That facility currently employs 132 people. A 100 percent employee-owned company, SEL has 51 domestic offices and 42 international offices, and three manufacturing facilities in the United States and one in Mexico. There are currently more than 3,400 SEL employees worldwide. The Spokane Valley office will accommodate up to 48 people, but the exact number to be assigned there is still being determined. Renovations are expected to be completed by September. SEL serves the power industry worldwide through the design, manufacture, supply, and support of products and services for power system protection, monitoring, control, automation, and metering. SEL offers unmatched local technical support, a worldwide, ten-year product warranty, and a commitment to making electric power safer, more reliable, and more economical. The 4th Annual Sekani Adventure Day is set for this Saturday, from 10am to 3pm at the Camp Sekani recreational area and adjacent Boulder Beach in Spokane. People can participate in a variety of outdoor sports with gear provided by the City of Spokane Parks & Recreation and local outdoor companies. Activities include mountain biking, archery, hiking & climbing and more. Paddle boarding, canoes & kayaking are also part of the event. Sekani Adventure day allows families to participate in these and other sports using provided gear, so they can have a fun family experience without a large equipment investment. Advanced registration is $9; admission at the door is $15. Camp Sekani is located at 6706 E Upriver Drive. Visit www.sekaniadventureday.com to register or for more information. With a cold beverage in your hand, and 'sand' between your toes, have an evening of fun and networking, mingling with fellow LaunchPad members July 25 from 5 to 8 pm, at George Gee Auto in Liberty Lake. LaunchPad INW is partnering with Connect NW, a nonprofit organization dedicated to connecting a community of investors with the most promising entrepreneurs and early-stage companies in the Inland Northwest. Join them for an evening of food, fun and get an update to LaunchPad's newest project, Launch Spokane. Cost is $20 in advance and at the door (Cash, Checks and CC accepted). You do not have to be a LaunchPad member to attend this event. RSVP at www.launchpadinw.com/events/launchpad-inland-nw-quarterly-networking-event. David Flores and chef Ramiro Urbina, a former cook at Flaming Wok, recently opened Happy Dragon Express, a Chinese to go restaurant at 825 N. Monroe street. The new take out spot offers a variety of Chinese menu items like orange chicken, sweet and sour chicken, and Mongolian beef, along with teriyaki items and rice bowls. The Happy Dragon also has free delivery service. Just call 509-315-8033. They are open Monday through Saturday from 11 am to 9 pm and Sunday from Noon to 6 pm. The Spokane Public Market has extended their hours and will now be open on Sundays from 11am-5pm. Spokane's only year-round public market features over 50 local vendors located Second Avenue and Browne. InCyte Pathology welcomes Alden R. Webb, D.O., to its growing Dermatopathology Services Department. InCyte Pathology's dermatopathologists work closely with area dermatologists to provide the best treatment for patients with skin conditions and diseases. Prior to joining InCyte Pathology, Dr. Webb was completing his fellowship at Indiana University School of Medicine in Indianapolis, IN. He will begin working at InCyte Pathology in early August. Dr. Webb is board certified in anatomic and clinical pathology, and board eligible in dermatopathology. He graduated from the Chicago College of Osteopathic Medicine, Midwestern University in Downers Grove, IL and completed his residency at the Indiana University School of Medicine. Grocery Outlet at Sprague and Havana is hosting 'Independence from Hunger' for the month of July. Their customers can donate food or cash which will go directly to Spokane Valley Partners, home of the Valley Food Bank. Spokane Valley Partners is experiencing extreme growth in food bank usage with 2012 year to date up 26% over 2011 same six months. Grocery Outlet customers can purchase prepackaged non perishable food or donate cash at the check out counters. For more information contact Don Kaufman at 509-927-1153. Spokane business owner Tammy Vose, owner of SchoolPals Fundraising and Elf Shelf Holiday Shops, offers fundraising and holiday stores for schools and teams. She has two new websites to facilitate her businesses, both developed by Switch Up Web of Spokane. They are: www.schoolpalsfundraising.com and www.elfshelfholidayshop.com. The websites offer clear audience and task-focused shopping abilities that will appeal to school districts and non-profit chairpersons, such as PTA and PTO leaders, who are most often parents of young children. For fundraising, SchoolPals Fundraising offers candy bars, lollipops, school supplies and novelty items that can be purchased in bulk and sold with a mark-up by sports teams, school bands and community organizations to raise money. Elf Shelf Holiday Shop is a temporary holiday gift store set up in elementary schools that allows kids to budget money, shop for family and have a fun activity during the holidays. Gifts and supplies are sent on consignment so there is no prepayment required and schools only pay for gifts that were purchased by participants. Tammy Vose, owner of SchoolPals, LLC, and a distributor of the Elf Shelf Holiday Shop program, entered the fundraising industry nearly 10 years ago. She is a fundraising professional who works with schools, groups and individuals nationwide offering the Elf Shelf Holiday Shop and direct-sale fundraising products. Switch Up Web is a full-service website development company located in Spokane and operated by long-time website and technology leaders Kirt Runolfson of Interlink and Jennifer Ferrero. The Spokane Shock promoted Ryan Eucker to director of public relations and marketing. He has been working for the team's ticket department for the past two years. There will be a documentary screening of 'Fixing the Future,' Thursday, July 19 at 7 pm at the Magic Lantern Theater, 25 West Main. The admission price is $5 available at the theater. In Fixing the Future, public media star David Brancaccio (of Marketplace and NOW on PBS) visits locations across America that are attempting a revolution: the reinvention of the American economy. By featuring communities using sustainable and innovative approaches to create jobs and build prosperity, 'Fixing the Future' inspires hope and renewal amidst economic collapse. The film highlights effective local practices such as: community banking, local business alliances, time banking/exchange, worker cooperatives and local currencies. Following the film will be an exclusive onscreen discussion panel featuring Bill McKibben, Majora Carter, Mike Brady and David Brancaccio. The event facebook link is www.facebook.com/events/254492947999122/.